While details about what they will actually be doing are somewhat scarce, we can tell you about four roles that are being cast for NBC’s pilot based on the DC/Vertigo comic book character John Constantine. First off, there’s John Constantine himself. Since we haven’t read the casting breakdowns or anything, we can’t tell you what age they’re casting, but we’re surely hopeful that he’s British. That’s not asking for too much, is it? 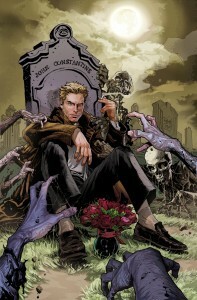 Also being cast: “Chas,” who we can assume is John Constantine’s longtime friend Frank William “Chas” Chandler, who first appeared in Hellblazer #1. Chas is a longtime friend of Constantine’s, and is a taxi driver by trade. He is also often the muscle to Constantine’s brains. “Liv” is the name of another character being cast – those down with their Hellblazer knowledge might have a better idea of who she might be, so please feel free to comment. Likewise, the fourth character being cast for the Constantine pilot right now is “Manny.” Any ideas? Hopefully we’ll be getting more details soon as the pilot shoot gets closer. Constantine is in contention for a spot on the NBC 2014-2015 schedule, which should be announced in May.